One of the most common questions new gardeners ask is "Which herbs should I use?" The truth is, you should use whichever herbs you enjoy the most. If you want a delicious oil to use for your next stir fry meal, tailor your selection of herbs to meet your taste in a stir fry. Looking for something to toss on a fresh salad? Consider your likes and the herbs most commonly used in salad dressings. Parsley, Thyme, Oregano, Laurel, Basil, Onion, and Garlic are some of the more common components of commercial salad oils. Unless you intend to use your oil within a few days, your herbs must be dried before adding to your oil. Fresh herbs have moisture in them and will provide a vehicle for botulism to form if added before drying. The water content will form a bubble that allows botulism to form and grow. 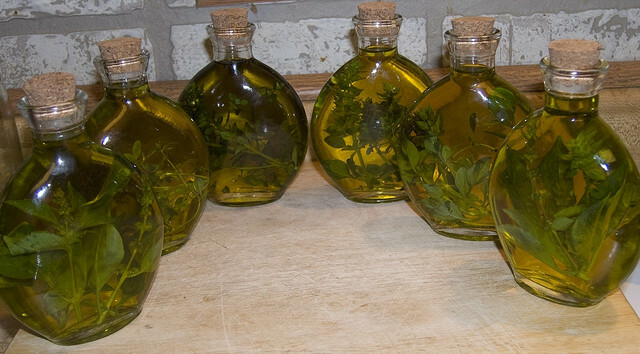 If you choose to make a quick oil with fresh herbs, refrigerate and use within a few days. Wash your herbs to remove any impurities. Fold wet herbs in a paper towel and press gently to remove excess water. Gather small bundles of herbs and tie together. I like to use small elastics for this as the stems may shrink a little and the elastic will shrink right along with it and keep your bundle secure. Hang these bundles by the stem in a cool well ventilated area to dry completely. You may wish to use your food dehydrator for drying your herbs, but be careful not to over-dry them, as they will become very brittle and may be difficult to insert in your bottle. To determine if your herbs are sufficiently dried, break a small section of the thickest portion. This should snap and not bend. You may wish to use extra virgin olive oil to take advantage of the health benefits associated with olive oil. It is a full bodied oil that imparts a wonderful golden hue to your finished product, but it is not the only choice. You can use Canola Oil, Peanut Oil, or even Safflower oil. A lighter oil will produce stronger effects from your herbs. Consider your own tastes and desires when choosing an oil. You have many options available at your local retail stores. You may want to purchase decorative bottles . Make sure they are clear to show off your finished product and have a cork or cap that seals tightly. You may wish to use bottles you have purchased oil in. If you aren't concerned about the presentation of the oil, you can use a jelly jar or other canning jar. Thoroughly wash the bottles in hot soapy water and dry them completely. Running them through the dishwasher on the top rack should do the trick. Be certain your bottles are completely dry before adding the oil. Select perfectly formed herbs from your selection of dried herbs. They should be ¼ shorter than the height of the bottle, from the bottom to the beginning of the neck.Limit your herbs to no more than two different herbs per bottle. The resulting flavor of your oil is difficult to predict if you use too many kinds of herbs in one bottle. Carefully insert your herbs into the bottle you have chosen. Inserting them with the stem down, will cause the leaves to fold inward as you insert them. Once the oil is added, the leaves will unfold slightly. Use tweezers or a dowel to arrange the herbs in the bottle in an attractive arrangement. Pour the oil over the herbs until it reaches the bottom of the neck. Your herbs should float freely to the top of the oil. Wipe the top of the bottle free of oil and cap tightly. Set your bottles in a cool dry place out of direct light for approximately a month to allow the flavor of the herbs to disperse in the oil.